If you're considering buying a set of Koni Sport dampers for your ride, you're certainly on the right path to an excellent suspension setup. There's no question that Koni makes some of the best dampers on the market and they'll likely be the last ones you ever buy for this car, no matter what else you do in the future with your springs. 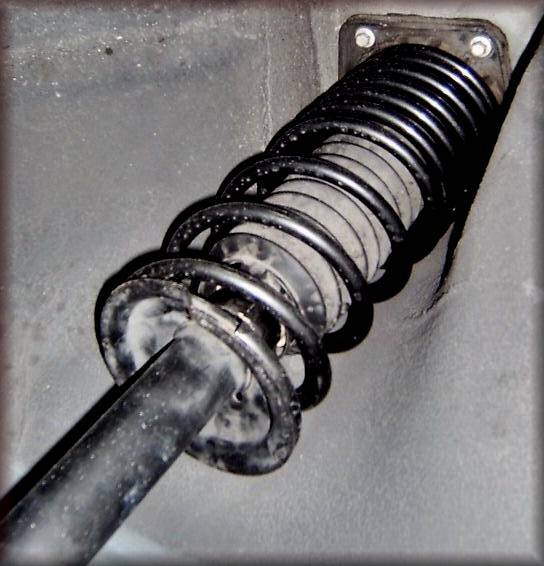 With that said, even if you've installed dozens of sets of springs and struts in the past, you may not realize what you're in for when it comes to the installation procedure for these particular struts. While you can certainly still do it in your driveway, I strongly urge you to first read these directions thoroughly and at the very least, ensure you've got the necessary tools for the job up front before you turn the first nut. 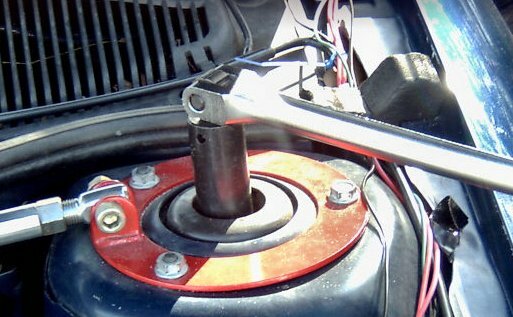 This is a guideline for installing the Koni Sports adjustable struts and shocks with new springs on a third generation J-Body. In This guide I will give recommendations for what I think will make this an easier job. As some will tell you, this job has its pitfalls. I write this under the assumption that you are mechanically inclined, but have never taken your suspension apart before, which is where I was at before I did this myself. I read the tutorial that was written some time ago and it helped me a lot but I want to add pictures and be a little more Newbie friendly. One of the things that people should realize is that all third gen J-bodies have the SAME parts for this. All of the parts are interchangeable, whether its a base model, LS, RS, Z24, Ecotec it doesn't matter. Yes; there are differences, but those are the handling packages that GM offers and they to are interchangeable with all the other cars. I also want to note that the front strut mounts changed from 99 to 00 but either will work. Which is better is up for debate, but both are fine for this installation. 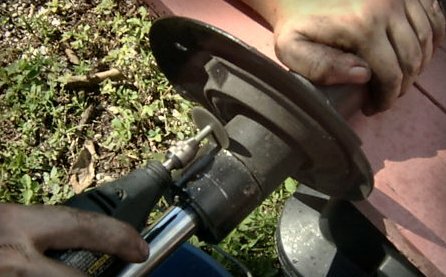 Angle grinder with cut-off wheel. Wire brush or cup style wire brush that you can use in a drill. Lower shock bolt all- 52 ft lb. Strut to steering knuckle-133 ft lb. Strut to body - 18 ft lb. Strut damper nut -52 ft lb. I did the rear first. Everyone says the rears are really hard to do so I figured if I did the rears first then it would be easier from then on. I was right. The one thing that makes the back of the car difficult to install is the strut mounts. 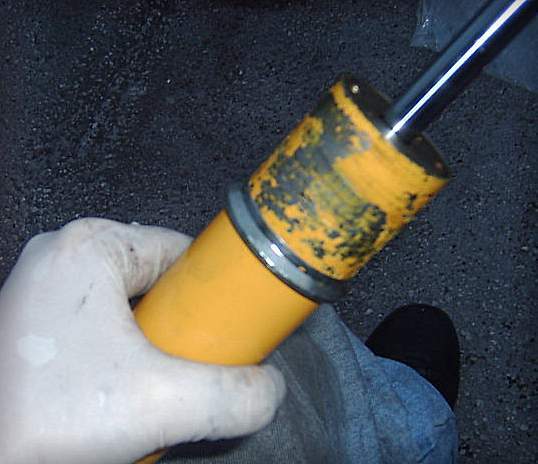 The stock struts have a shaft that is about 3/8". The Koni strut shaft is really beefed up at 1/2". It sounds easy. Just drill out the mount to a half inch and presto, you're good to go. Well the bad part is that you have to drill about 1 1/2" inches of suspension grade steel. The drill bit doesn't have anything to bite into, so with out a drill press this is a really difficult task. I tried this with a hand held drill and drained a 14.4 battery in no time. Note from Wild Weasel: I did this with a hand-held corded drill and had no issues at all. The drill went through the mounts like butter. Just have some else hold the mount while you drill through it and make sure they're wearing gloves. This is the stock mount when removed. This is the mount after it has been drilled out. Ensure you have a good drill press and not one of the $99 ones from Home Depot. They just don't have the muscle to finish the job. This is what I have, and is just fine for woodworking but not this sort of thing. 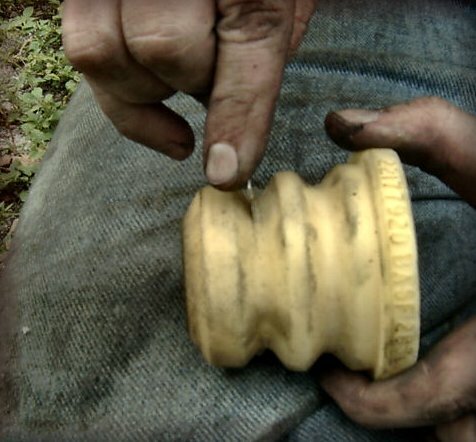 Be sure to use cutting oil, or WD-40 on the bit and reapply often. If you use WD-40 you will have to put it on more often. 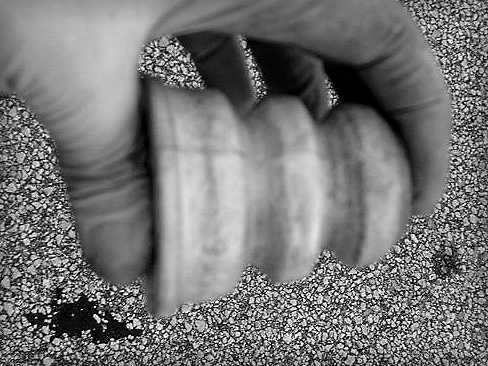 The easier and faster solution is to pick up a new set of rear mounts and find someone with a heavy-duty drill press to drill them out for you. I wish I had thought to do this the first time I disassembled the car. I am lucky enough to have a friend (Frank) with a big drill press. It only took about 5 minutes to drill out both. 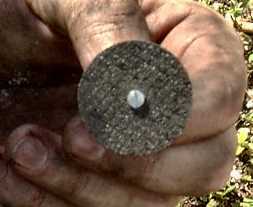 Having them drilled and readily available for installation is a big time saver. Find a level place to work on the car. Ensure the shifter is in reverse if it's a manual and chock the front wheels if you have chocks. Set the parking brake. If you have a rear strut tower brace then you will need to remove it. 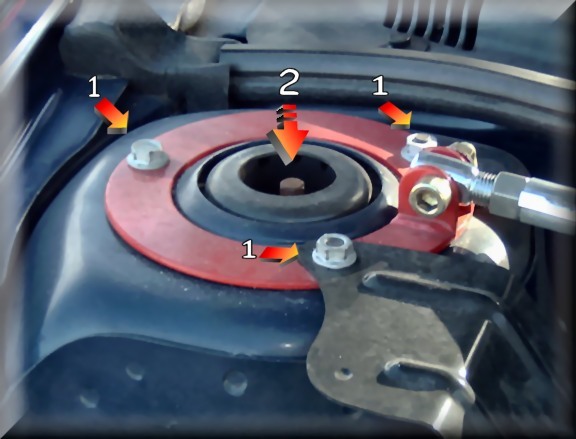 You can now open the trunk and remove the nut from each side on the top of the rear strut towers. 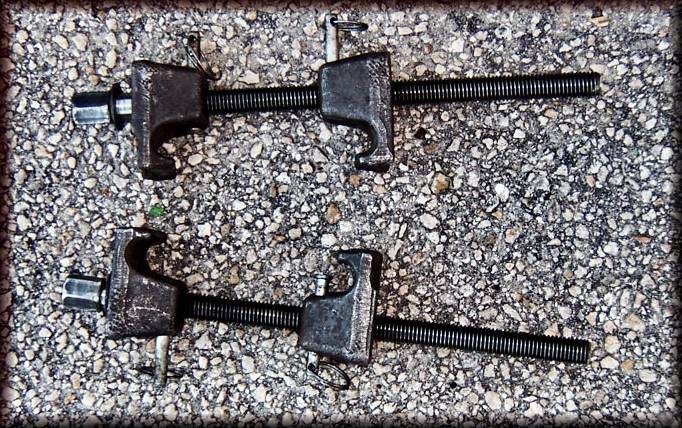 The mounts are held to the car by two bolts coming up from underneath and one nut secured in the trunk. If you remove that nut now, it will save you from climbing up into the trunk once the car is jacked up. Jack the car up, and support it on a jack stand. Now do the same on the other side so the whole rear of the car is in the air and supported on the jack stands. 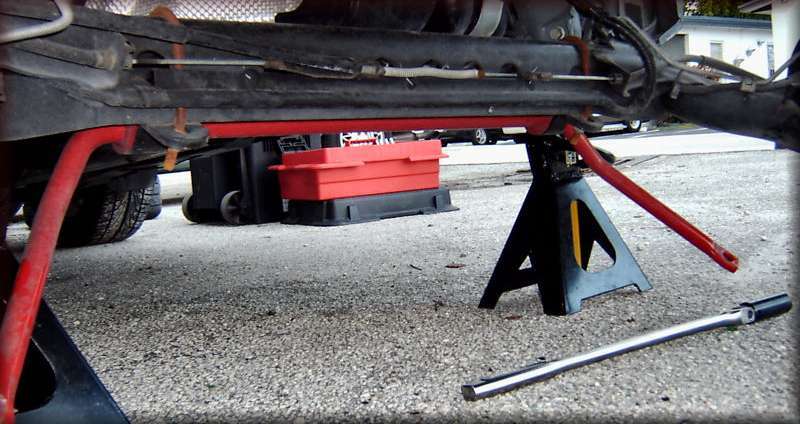 DO NOT PUT THE JACK STANDS ON THE TRAILING ARM, it needs to be free to move to do this. WARNING: Never work under a car that is being held up by a jack. This can result in serious injury or death. Always support the car with proper jack stands when working underneath it. These next few steps should be done once side at a time. 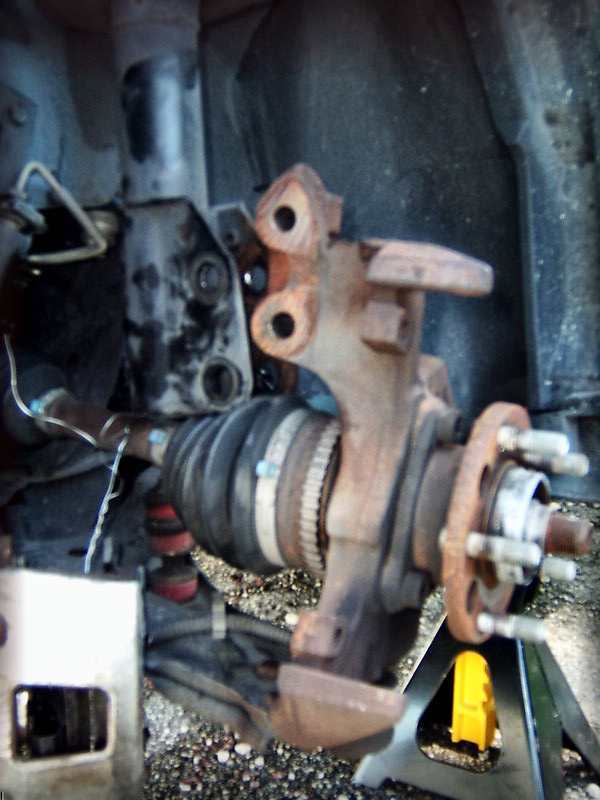 If you remove both sides at once, the trailing arm will drop down and generally be a nuisance. 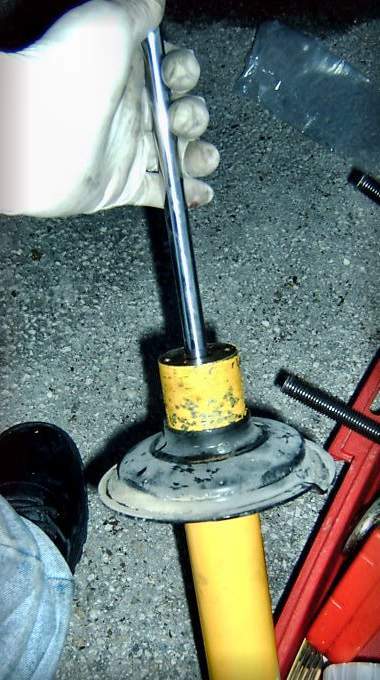 With a 19mm socket on a breaker bar, remove the two shock to trailing arm bolts. 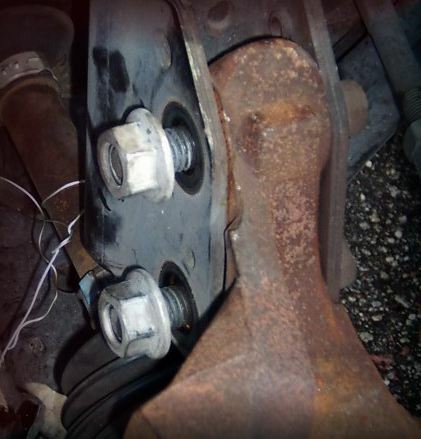 If you have a rear sway bar you may need to disconnect the end links this time. 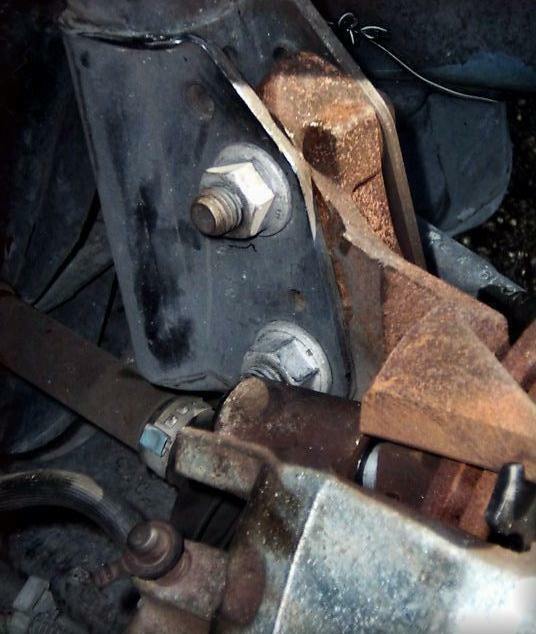 When both bolts have been removed push the trailing arm down out of the way. you can pull on it, or just step on it a little. Without the struts for support the arm moves down with little effort. 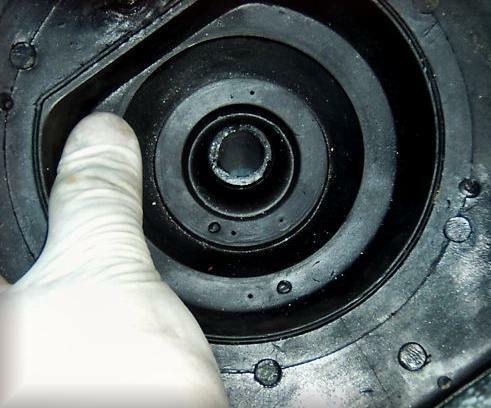 Hold the shock assembly while you remove the two 10mm bolts in the wheel well, and lower it down and out. 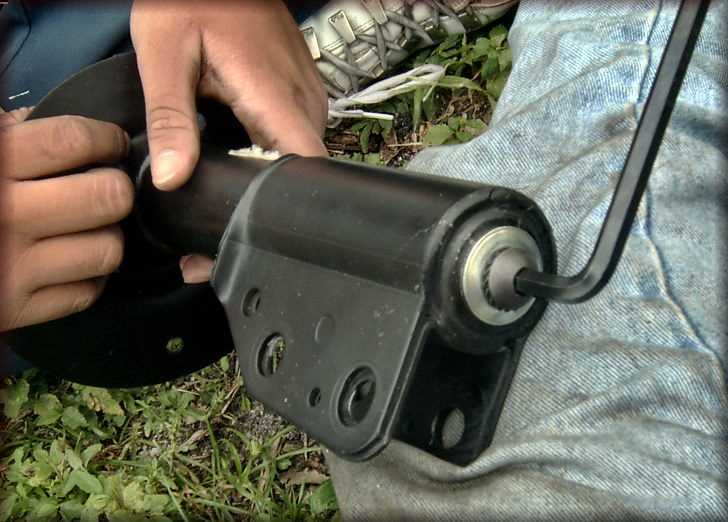 Use a spring compressor to relieve the pressure on the shock mount. 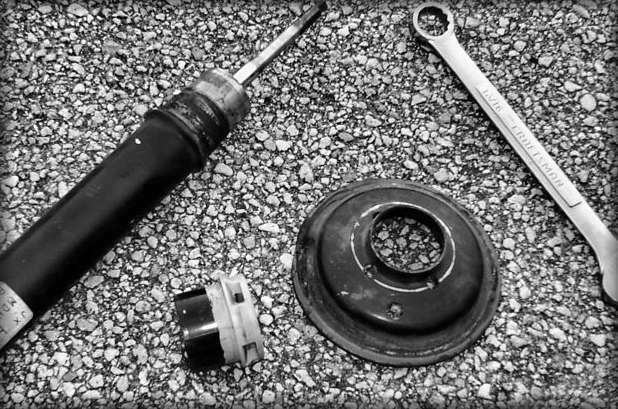 Using a crescent wrench and an open end wrench remove the top nut and washer. 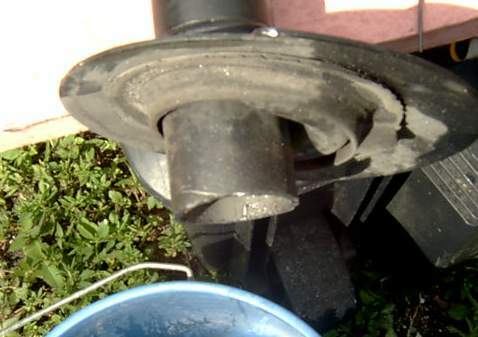 Note that an impact wrench will make short work of this and if you don't have one, then you didn't follow the first bit of advice at the very top of this install guide. Lift the mount off and remove the spring, dust boot and washer. The dust boot will pull off with a bit of effort. Now we get to have some fun. Knock the bottom spring perch off with a hammer. You just need to tap it while you rotate the strut. It will work itself free in no time. Remove the plastic cap and perch and set aside. Be sure to keep the perch handy. I cleaned stuff up as I went. I used a shop towel to get rid of some dirt and grime. There is a small stainless ring that came in the box with the shocks. This ring fits unto the Koni strut to hold the old spring perch in place. Be sure to put the ring on with the tapered end facing up. Put the spring perch on. Don't put it upside down! Many people have done it, only to feel stupid when the problem makes itself apparent in the ride height once everything is back together. 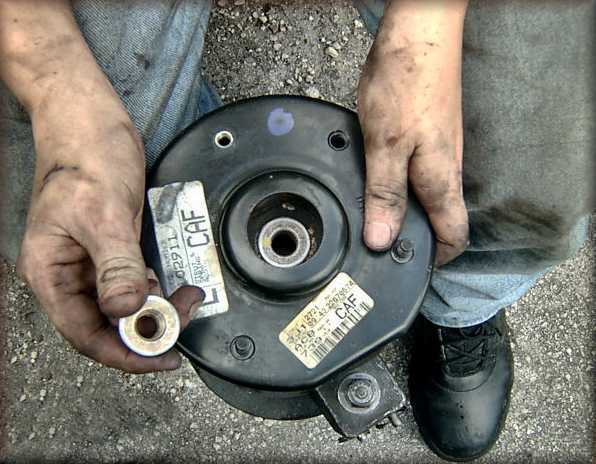 If you're putting on new springs, decompress the old one and compress the new spring. If you're reusing the same springs, then this step is already done. There is a small foam piece stuck up in the dust boot. That's the bump stop. If you're putting on lowering springs, you may need to shorten it. Check with the instructions that came with the springs. For this, I am putting on Eibach Prokit lowering springs and cutting the bump stops accordingly. Put the bump stop on with the narrow end pointing down. Now put the washer that you got at the hardware or auto store on the shaft. Put the dust boot back on. Push the foam bump stop up into the dust boot with the washer trapped in between them. 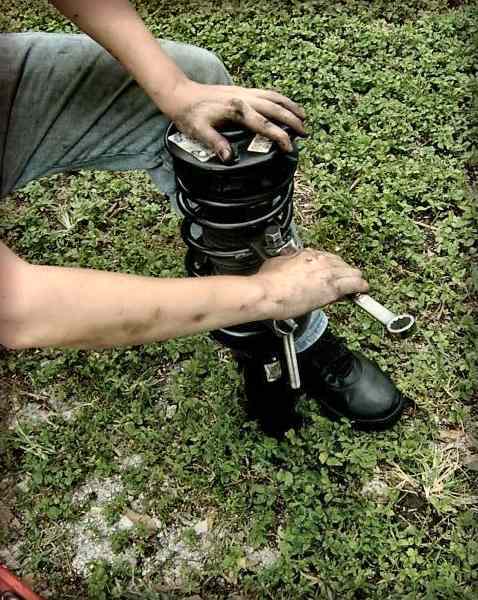 Push the metal cap onto the dust boot. Put the compressed spring on the perch and line up the coil end with the notch in the perch. 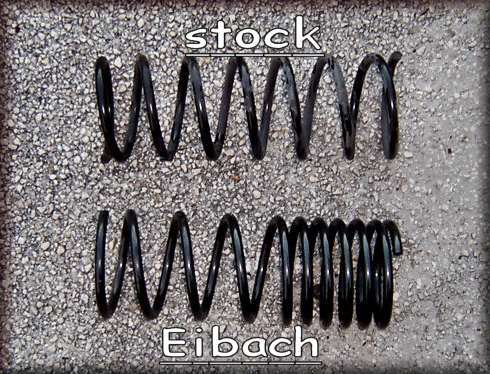 This is the difference between a linear spring and a progressive spring. 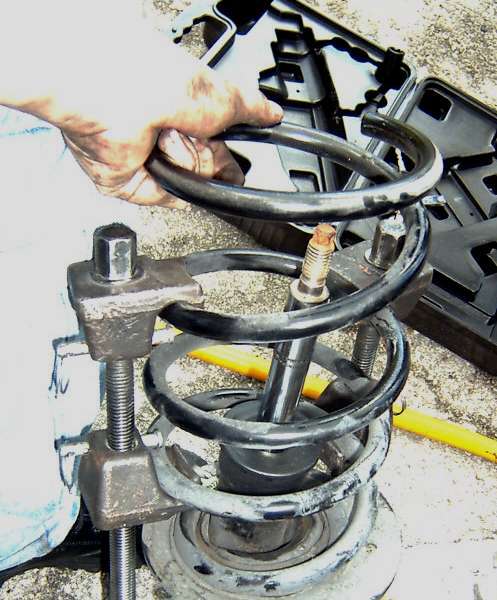 If you are using progressive rate springs, put the closer spaced coils at the top. 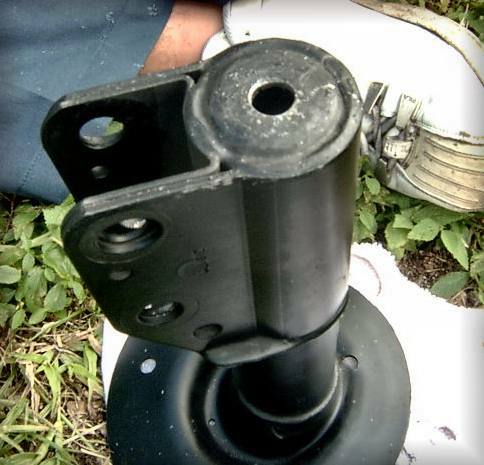 Put the strut mount on top of the whole assembly, put another washer on top, then put the nut on and tighten. Decompress the new spring and remove the spring compressor. Now use the impact wrench to tighten down the top nut as much as possible. 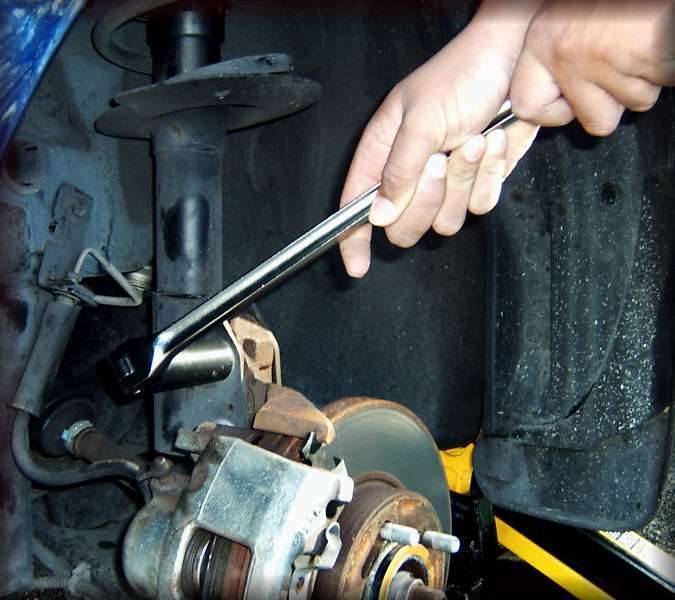 Ensure that the strut rod isn't spinning as you tighten it. Now put the strut back on. It will be easier if you have someone put the top nut on loosely once you line it up to hold it in place. Then put the two bottom bolts in and snug everything up. Don't forget to torque them down to 18 ft-lbs each. If you forget you'll have to remove the tires again later. Note that you can easily exceed 18 ft-lbs with a 1/4" ratchet so you really should be using a torque wrench here. 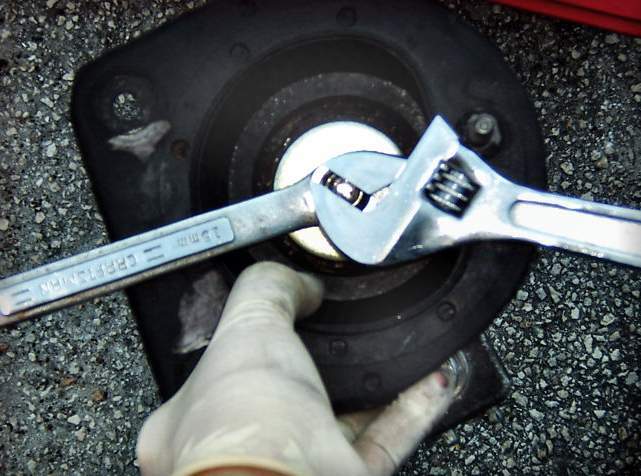 You may not be able to get your torque wrench over the nut on top of the strut mount. Having just tightened the bottom two, you should have a pretty good idea what 18 ft-lbs feels like. Don't worry too much as I haven't heard of people stripping the rear mounts like they do with the front. Now attach the bottom bolt to the trailing arm. Torque to 52 ft-lbs. Now repeat this whole procedure on the passenger side. Having just done it once, the other side should go good and quick. Put the wheels back on and tighten the lug nuts to 100 ft-lbs. If you have tuner lug nuts, tighten them to 90 ft-lbs. Take out the jack stands and lower the car to the ground. Now the rear is finished, if you didn't torque the nut on the inside of the trunk or have a strut tower brace that needs to be reinstalled, do that now or you'll be wondering why the car feels sloppy later. You may be tempted to take it for a test drive and go for beers at this point, but just remember you have to use power tools for the front half of this job as well. If you lose fingers you won't be able to type and ask more questions later. As with the back, in the front of the car we will be doing one side at a time. Why? Well for one its easier, and two because, it will be a learning experience of course. the more important reason is that you will have a reference for how to put things back together if you get lost, which is not hard to do when you're tired. 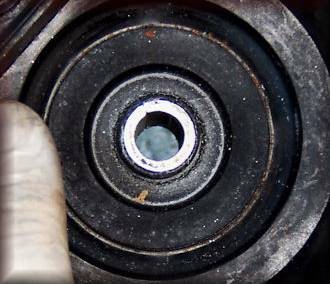 Open the hood and use the impact wrench with a 21 mm socket to loosen the top nut on the driver's side strut. Do not fully remove it at this time. 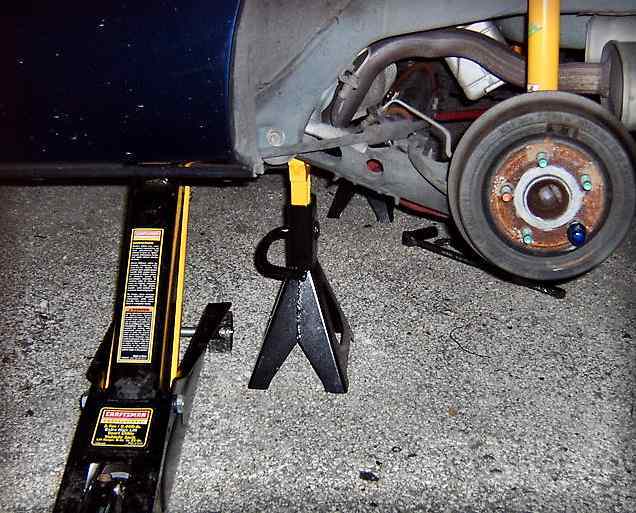 Jack up the driver's side of the car and support it with a jack stand. 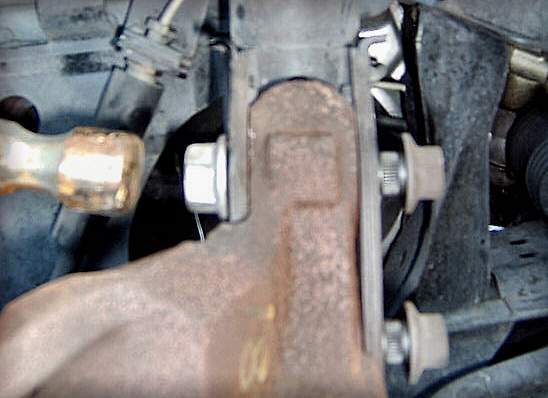 There are two large bolts that attach the steering knuckle to the strut. 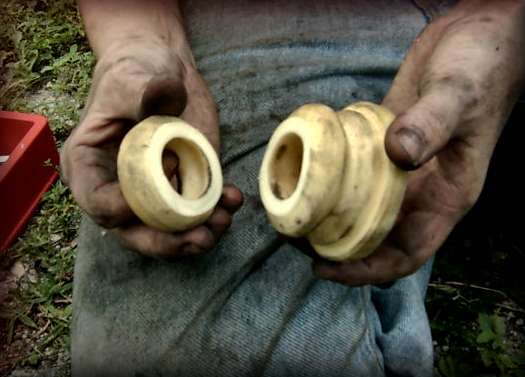 You'll need a 800 LB gorilla and two bunches of bananas to get these off. If you don't happen to have one handy, a 21mm socket and a breaker bar will also do the trick. 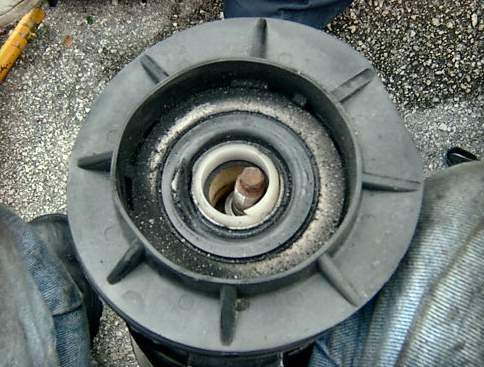 Be sure you are turning in the right direction and once the nuts are loose you can rotate them to the end of the bolt. If they don't come out right away, tap them through with a hammer. 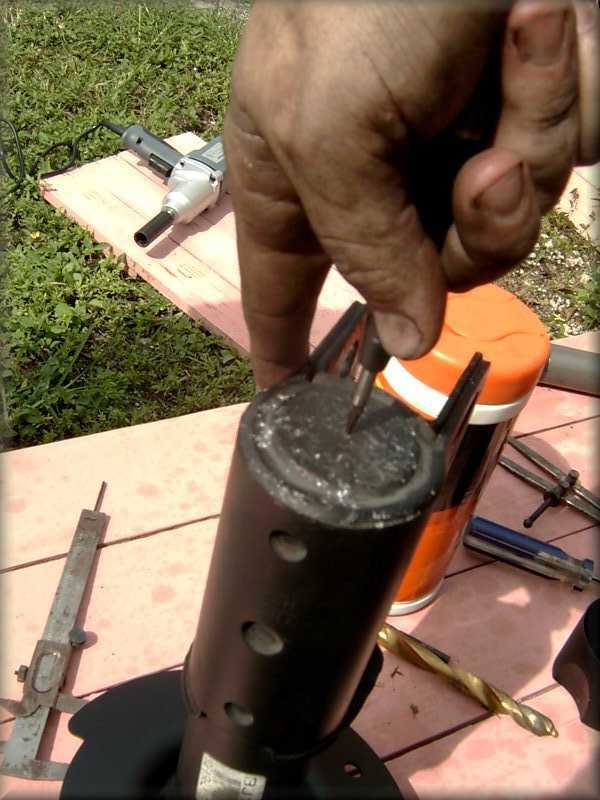 If you get to the end of the bolts and they have not loosened don't worry there is a remedy. take the nuts the rest of the way off and get a 15mm open end wrench and turn, it will back its self out of the hole. 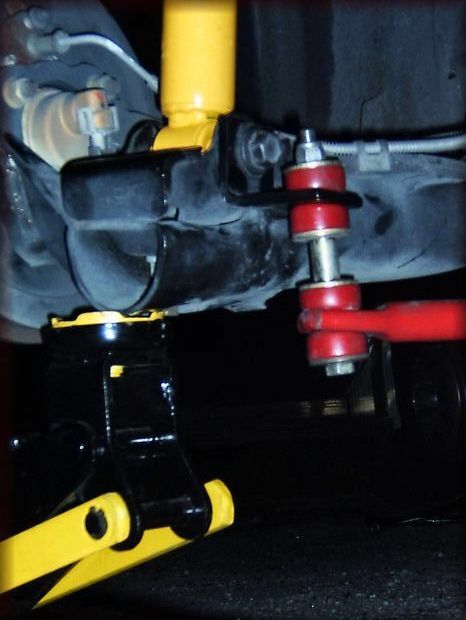 ( the reason you don't do this for the whole bolt is because there are teeth on the bolt to keep it from rotating and loosening when you drive down the road, you have to clear these before you can consider using a wrench directly on the bolts)/ if you have a front anti sway bar loosen but do not remove the nut on it to facilitate removing the strut. just run it all the way to the end and let it hang still attached. On the top of the strut towers there are two nuts and one bolt these need to be removed, it might be a good idea to have someone support the strut from the bottom while you do this to avoid damage due to gravity issues not resolved by GM. Once the top bolts are removed wiggle the strut back and forth till you work it free from the steering knuckle. if you angle it back toward the rear of the car you will be able to slide it out relatively hassle free. note I removed the brake caliper and rotor for the picture only it is not a necessary step. 6.now that you have the strut assembly removed its time to take your life in your hands once again. 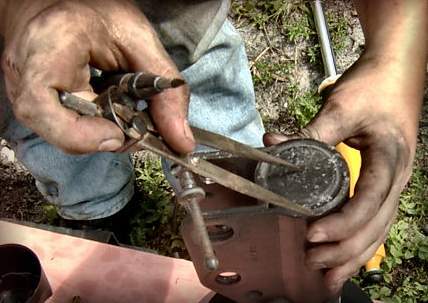 get the spring compressor out, by this time you should know what to do with it. Now that the spring is compressed you have to remove the top nut, this puppy is tight ladies and gentleman, I took someone else's recommendation and removed it with an impact wrench. 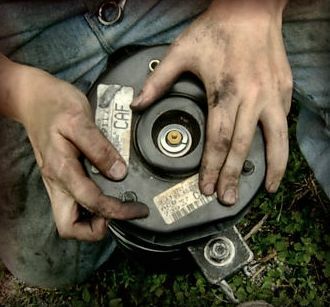 if you DID loosen it before removing it from the car it is possible to take it off with a breaker bar, and a friend holding the assembly tightly, a quick jerk on the bar should allow you rotate the nut faster that the shaft that is holding it, just long enough to free it, after that you should be able to finish with your fingers. The top plate of the front assembly is actually two pieces ( 2000+), take the two pieces off and set them to the side, be sure to keep them clean from debris in your work area. Now remove the spring and dust boot. The bump stop is hiding in the dust boot just like the rear one, and there is no little washer to mess with here. This next part is a bit intimidating, but not nearly as difficult as it appears. The struts need to be cut open so that you can insert the Koni replacement inside it. You will need either a steel ruler or a caliper (dial or vernier will do) that has metric units on it for this task. You need to cut the strut open 40mm or 4 cm from the top of the strut case. DO NOT EXCEED 40MM, YOU HAVE TO ERROR DO IT TOWARD THE TOP OF THE STRUT. I.E; 38MM INSTEAD OF 40MM. The reason for this will become very clear as you finish your assembly. Note from Wild Weasel: David talks about getting this measurement exactly right but I've never had any trouble just eye-balling it. Just look at the pic here, and make your cut in about the same spot. As you'll see later with the rubber sleeve, you've got at least an inch worth of leeway here and are better off making the cut a little higher on the strut than the pic. Mark your strut at 40mm all the way around with a sharpie. Using a dremmel with the heavy duty cutting wheel score the strut all the way around the fluid from inside the strut will obscure the line you just drew since the strut is already black it isn't easy to see in the first place. A hacksaw will do in a pinch, but I do recommend some kind of cutoff tool. Note from Wild Weasel: If you have one, use an angle grinder with a metal cut-off wheel. You'll go through this thing in no time. Use a grinding wheel to clean up the edges when you're done. Just remember to wear gloves or you'll find yourself with the equivilant of a sunburn on your hands the next day. Note from Wild Weasel: I don't use this method to drain the struts. Before doing any cutting, I first drill the hole in the bottom described in the next step. Once you've got a 1/4" hole or so, you can now shoot the fluid out the bottom of the strut like a super-soaker by pumping the piston up and down. This isn't only faster than the above method, but way more fun. Just be sure to shoot it into a drain pan of some sort so you can dispose of it properly. While the strut is draining, you can cut the bump stop. Remove the first bump with a razor blade. Score it all the way around a few times then you can just snap it free with a twist. Alternately, you can go right through it quickly with a hack saw. With the strut now drained you can safely cut the rest of the strut housing and pull out the cylinder. Now we need to put a hole in the bottom so we can bolt the insert into place. Measure the diameter of the bottom of the strut and divide by 2 and mark it. TIP: MEASURE TWICE DRILL ONCE. Note from Wild Weasel: I seem to get this wrong every single time and end up having to demel the hole bigger to fit the bolt. Definitely measure and mark this! Once you put the insert in place, you will not be able to get it back out again so if the hole doesn't line up with the threads, you'll end up carefully grinding it to make it fit since you won't be able to just drill down anymore with the Koni in the way. Use a punch to be sure its centered. start with a small bit such as a 1/8", then a 1/4" and so on until you get to 1/2" bit. If you actually have one that is a little bigger than a 1/2", use it. It will make your life easier in the long run if the hole is a little off. 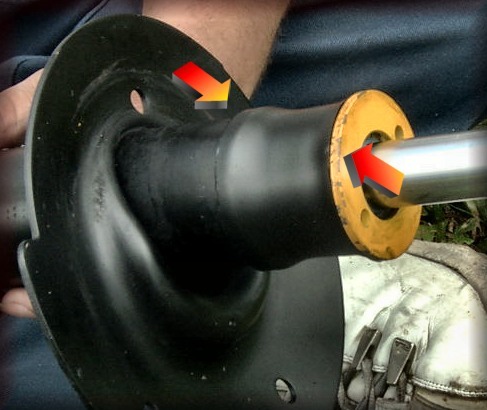 Before you insert the Koni into the strut housing there are two things you may want to do. First, make sure the hex head screw threads easily into the Koni. Run it all the way down and back up again. Second, hit your freshly cut strut with a quick spray of paint to combat rust. Now you can put the Koni into the strut. It will be a snug fit. If you can slide yours in all the way, you're in luck. Most are tight enough that they go in part way and then you need to tap them down by hitting the bottom of the casing on the ground. Take your time and just smack the bottom on the ground (where you drilled the hole) until the insert has seated all the way in the bottom. Put the washer and lock washer on with the bolt through it. I believe it was a 3/8 Allen key used to tighten it down. You may also want to consider using Thread-Loc when doing this. There are two rubber sleeves that came with your struts. Get one and put it on the thick section. It should be level with the top of the yellow part of the Koni, and cover the part where the old strut and the Koni meet over lapping about 1/8" or so. This is there to keep water and dirt out. Remember what I was telling you about not cutting it off too short? Note from Wild Weasel: Mine overlapped by quite a bit more. I cut off the stock struts higher so this rubber sleeve was about half on the stock housing and half on the Koni insert. 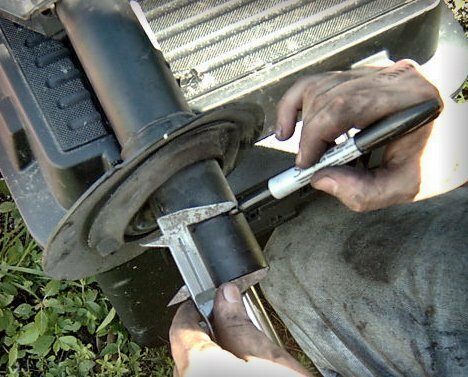 Take the plastic washer and place it on, put the shortened foam bump stop in the dust boot, and secure it with the galvanized cap that you took off when you disassembled the strut, place the sub assembly on the shaft. Now its time to place the bearing plate and top plate on. Be sure to use the cut washer when you put the top nut on. You will need to use either a breaker bar or an impact wrench to secure the top nut, see torque specifications. if there isn't enough room to put the nut on just tighten the spring compressor some more. IT WILL FIT, if I did it you can too. Now reinstall the strut. First put in the bolt and two screws hand tight holding the mount to the car. This will support the strut assembly while you place the two larger bolts at the bottom on the steering knuckle. Tighten and torque all the bolts. If you're having trouble putting it back in be sure that you have loosened the bushings for the front sway bar. Here again it helps to have two people for these steps. Tighten back the sway bar nut, put the wheel back on and lower the car. Repeat these steps on the passenger side. Almost done. Koni suggests that you set your struts to the softest setting for the first 500+ miles to break them in. Until you get an alignment I recommend setting your struts to soft. This is all the way counter clockwise. Now that you're finished with your part of the installation, you MUST take the car for an alignment as soon as possible! There is no need to wait for this. You don't need anything to settle or any such nonsense. Find a place and get it done as soon as you can. In some cases, everything might be fine but in others, if something is really off, you can really chew up your tires in a matter of weeks. Don't say you weren't warned! Koni suggests that you set your struts to the softest setting for the first 500+ miles to break them in. I set my struts to the softest setting until I got an alignment to reduce the hard ride and not tempt me to "push it". Let me tell you it was tough waiting a couple of days until I got that alignment. Let me tell you also that it was well worth the wait. After I left the shop, I pulled into a parking lot and set all the struts to medium. I thought I had died and gone to heaven. The turnpike was only two blocks away. I took it out for a spin. All I can say is what a ride. I stopped at a so called rest area and set them all to the firmest setting for the ride home. What Koni calls firm stands for rock hard I refuse to let the car roll in a turn OMG I've been turned into a Bobble-head hard!! Note from Wild Weasel: These struts are designed to handle anything you can throw at them. 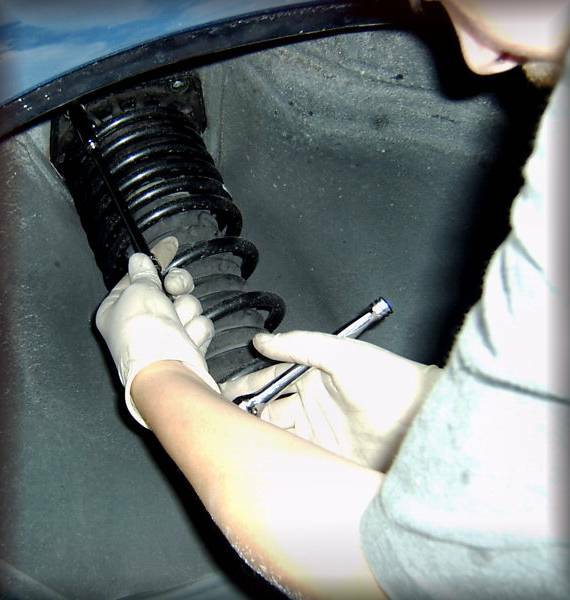 On their stiffest settings, they easily handle the spring rates of any proper coilover setup on the market. With that in mind, those settings are way to high for most springs, including those included with this kit. While it will be fun to stiffen them up every now and then, this really isn't how you should have them set up for regular lowering springs. All consideration for comfort is out the window, literally, but it sticks the road like glue. 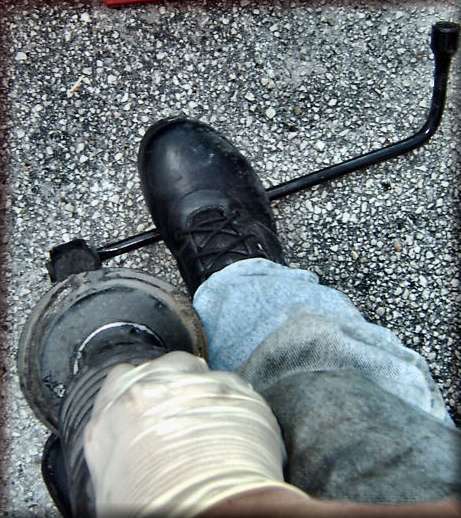 Technical Note: The adjuster turns a total of 630 degrees, or 1 and 3/4 turns. For the daily commute to work and what not I have it set to full soft in the rear and 1/2 turn from fully soft in the front. I like the mix between performance and comfort for everyday. Bradiscool.com for the spring install reference, Big jerm21 for the Koni install .pdf (Koni Reds with Coilovers), Juxter (Juxt3r), my not so little brother (Nick) for helping me do the install and taking some of pictures.